How to get a cover up tattoo in Bangkok. It really is quite surprising how many people who have one or more unloved tattoos on their bodies are blissfully unaware that there is a great alternative to tattoo removal. They don’t realize that there is a growing industry in the wide tattoo world that specializes in the design and application of totally brilliant cover-up tattoos. What sort of people might qualify for a cover-up? Those who have had a ‘bad tattoo’ done that just didn’t turn out the way they wanted it to. Those who have the name of an ex-lover tattooed on their body that these days they would rather forget. Those who had a tattoo design done that they wish they put more thought into. But your tattoo doesn’t even have to be bad or old to qualify for a cover-up. Maybe you had a tattoo done in your rebellious youth that no longer looks quite so cool, especially now that you are married with kids. Or maybe you have simply changed your mind about what actually looks good on your body – whether the tattoo was done last week, or ten years ago. Whatever the reason, the simple truth is that every time you get a glimpse of the offending design on your skin, you inwardly shudder, and you wish that you never had it done in the first place. Then they discover that not only is tattoo removal very expensive, but that it can take many months – and can also be quite painful. There is another option, one that is so much better than trying to ‘remove the irremovable’. At All day Tattoos in Bangkok, we strongly feel that a getting a cover up tattoo should not be your second option – it should very much be your first option and in many cases, your only sensible option. However, we must emphasize that getting a top-class cover-up job is not completely straight forward. A cover-up is not the same as having a brand new tattoo imprinted on a fresh area of skin. So if you go to an artist with limited experience of this type of work, you risk getting a cover-up tattoo that may be excessively dark; or you may end up with a tattoo that has traces of the old tattoo still visible in the background. You really only have one chance to get a cover-up right as the excessive working of the same piece of skin can result in scarring. The good news is that there have been many advances in cover-up techniques over the past few years, and provided you go to experienced, expert cover-up artists, such as we have at All Day Tattoos, they can truly work wonders. Rework your badly done or fading tattoo. This will involve leaving the original design intact and enhancing it with bolder lines and colors, transforming a tired looking design into something new and fresh – sometimes by embellishing and adding to the original design. Completely disguise the original tattoo and turn it into something totally different and more attractive. Your new tattoo may be anything from 30% larger, to as much four or five times the size of the original. This will depend on the original design, the colors and scope of the proposed cover-up design. Often the size has to be much larger, due to lines or shading on the outside edges of the original that need to be cleverly disguised into a new design. Much rests on the original design and your personal preferences as to which of the above choices will work best for your tattoo. Our experts at All Day Tattoo will discuss the range of design options available to you, and explain what we believe will or will not work well; all as part of your free consultation. Every cover-up job is a new challenge and the artists will use their skills and imagination to conjure up something unique that will work for you. Firstly, we will need to see your original design and get a good idea of what the possibilities are for covering it up. Sometimes the possibilities are wide open and pretty much any new design will do, and others the original design will put some limitations on what would work to cover it up effectively. Another option that is sometimes suggested for large and very dark tattoos is to undergo a few sessions of laser removal to fade the ink before the cover-up work commences. No matter what, our artists will be open and honest with you about what will look good, and what they expect the end result to be. All we want is to make sure that, if we go ahead with the work, you’re thrilled with your new tattoo. Choosing the right colors for a cover up design is of equal importance as the design itself. Skilled artists will be well versed in what colors will or will not work. They will use their talents and experience to ensure that the end product is a thing of beauty, even though there may be restrictions in what colors they can use. Your tattoo is made up of ink which lies roughly 1 millimeter beneath your skin surface, in the ‘dermis’. When doing the cover-up, the artist will inject a new ink into your original tattoo, in the same area of the dermis, which then mixes with the original ink. But color choices are not as restricted as they used to be. In the early days, black was traditionally the main color used as it is the most effective in hiding old colors, but as you can imagine, it is not the most effective way of doing a nice-looking cover-up. These days, artists are able to use darker shades of red, brown, orange, green, blue, purple and dark magenta in their cover-up work, and even lighter shades can be used where the original ink is also light. Darker shades of the same colors will cover the original colors. 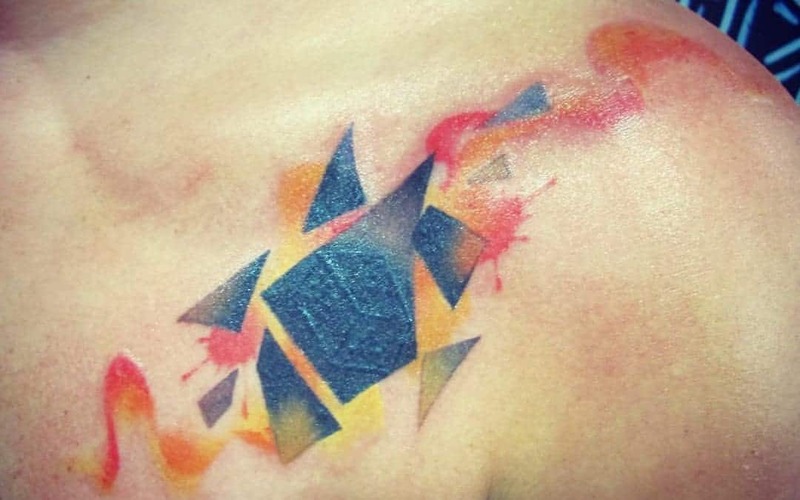 Also, new ink, when mixed with old, will create completely new colors – for example, red and blue will make purple. At All Day Tattoo, our artists only use the finest imported inks from the USA and can advise you on what inks will work for you to give you the effect you want. A tattoo that has a great amount of detail. Animals or mythological creatures with scales or feathers. Large birds, such as vultures, ravens or eagles. Mechanical robots with a lot of detail. Devil-type characters in dark robes. Dark floral designs, with plenty of leaves. What can All Day Tattoo do for you? Are you are in Bangkok or will you be visiting? Do you have a tattoo that’s making you miserable? Whatever the size, or complexity, and whatever the reason you want to be rid of your tattoo, if you really don’t like it, why not give serious consideration to having it covered-up? At All Day Tattoo, our expert tattoo cover-up artists will discuss your options with you. We are confident that you will find us friendly, sympathetic and we will treat your tattoo requirements with the utmost respect. Click the button below to book a free, no-obligation consultation.